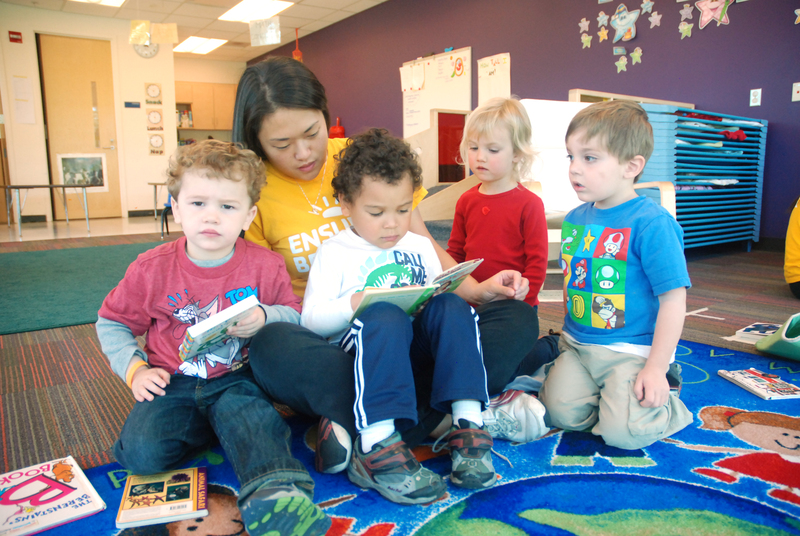 The Ann Arbor YMCA’s full day and half-day, nationally-accredited Early Childhood Education Programs focus on providing a safe, nurturing environment where children can thrive. Our trained staff guide children through an age-appropriate curriculum that features exploration and discovery as well as instilling the Y values of caring, honesty, respect and responsibility. Since 2008, our child development programs have been accredited through the National Association for the Education of Young Children, or NAEYC. Children in our daycare programs are encouraged to develop confidence, creativity, critical thinking skills, and a positive self-image as well as other skills necessary to be successful in Kindergarten. Our Early Childhood Programs use The Creative Curriculum, which allows teachers to focus on the children’s learning interests while working on age appropriate objectives for development and learning. Daily planned lessons include centers and small groups focusing on creative expression, sensory experiences, language, writing and literacy experiences, STEM topics and opportunities for age-appropriate physical activities, which aligns with the NAEYC required learning standards. All of our child care classrooms invite children to make free-choice selections throughout the day with an emphasis on dramatic play, fine and large motor development, construction, writing and language, and transportation exploration. The Early Childhood Parent Handbook may be found here. For more information about any of our Child Development Center, or to inquire about the waitlist and enrollment, please contact Lee Anna Pasker Edens, Regional Child Care Director at lpasker@annarborymca.org or 734.661.8058. Our Early Child Care full day program runs year round, and is open Mondays to Fridays from 7:30 a.m. to 6:00 p.m. The full day program offers three, four, and five days per week attendance. Each day our Child Care staff provides morning and afternoon snacks, centers, large motor activities, and rest time in the afternoon. Families provide a packed lunch for their child and a blanket for rest time. All Star classroom is for children ages 2 ½ to 3 ½ years. Children do not need to be toilet trained for this room. Child Care Staff will work with families and your child on toilet training and other self-help skills. The Aviator classroom is for toilet trained children ages 3 ½ to 5 years. The Aviator Room offers weekly swimming lessons, which are included in tuition. Swim instructors and classroom teachers work with children on swimming skills and give them time for free play in the pool. Our Half-Day Pre-K Program is for toilet trained children ages 3 1/2 to 5. The program meets Monday to Friday from 9:00 a.m. to 1:00 p.m. and follows the Ann Arbor Public Schools Calendar. The Half-Day Pre-K Program focuses on providing a safe, nurturing environment where children can thrive and gain self-confidence prior to enrolling in full-day kindergarten. This program offers four and five day per week attendance. Children bring a packed lunch each day. Half-Day Pre-K includes weekly swimming lessons. Swim instructors and classroom teachers work with children on swimming skills and give them time for free play in the pool. Fees listed do not include Registration and Deposit Fees. Please contact Lee Anna Pasker-Edens, Child Care Director, for more information and availability at lpasker@annarborymca.org or 734.661.8058.